As a manager, Lattice gives you the ability to discover and manage information about your direct reports on the "Your Team" page. To get here, click "Your Team" in the top navigation bar. When you first land on the "Your Team" page, you will quickly find a list of your direct reports. On the left side of the page you will find a navigation bar which will allow you to view your team, manage Updates settings, and view various tool usage metrics for your team. 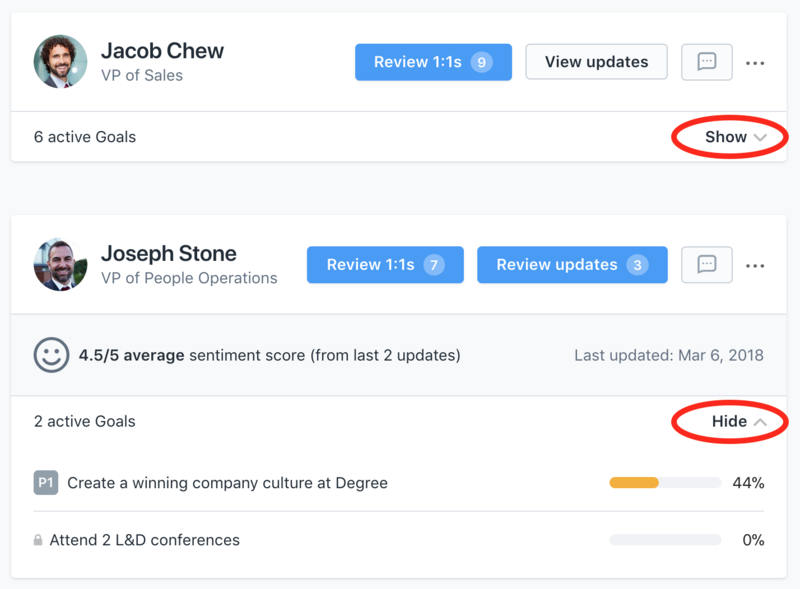 If you have this feature enabled, you can now see your direct reports' updates, plan/review their 1:1's, and see an average of their sentiment scores from previous updates. Blue buttons indicate that there are actionable items. A badge lets the manager know how many outstanding updates and 1:1's there are for that report. By clicking the ellipsis to the right of the blue button, you can quickly manage, enable, and disable that individual's updates and 1:1 feature. Click "Updates" on the left side of the page to see and filter through all of your team's Updates. For a quick view of Update participation and sentiment by individual or participation by manager, click on "Individuals" or "Managers" next to "All Updates." Click "1:1s" on the left side of the page to see and filter through all of your team's 1:1s. For a quick view of 1:1 participation by manager, click on "Managers" next to "Individuals." If you have the Goals feature enabled, you will be able to see the active goals for a direct report. You will also have the ability to create goals for them. By toggling the "Show" and "Hide" buttons, a drop-down list will appear showing any active goals and where that individual is in achieving that goal. To view a goal in detail, simply click the title. To create a goal for your direct report, click on the ellipsis next to the blue button and select "Create a Goal." The Feedback column on the right shows activity between your direct reports. To view feedback you have given, you can use the drop-down menu at the top of the Feedback column. 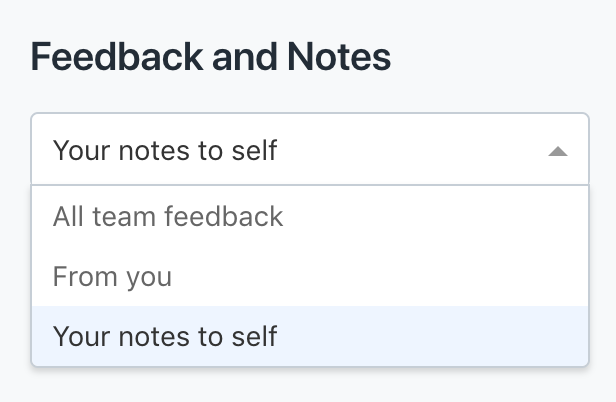 Here, you can also give yourself feedback or write notes! Quick Tip: You can also quickly leave feedback for your direct report by clicking the message icon on your direct report's user card. Click "Feedback" on the left side of the page to see and filter through all of your team's feedback. For a quick view of the number of feedback given to or from an individual or by manager, click on "Individuals" or "Managers" next to "All Feedback." Under the "Reviews" section, you will be able to manage and view each review cycle that you and your direct reports currently participate in. Here, you can select peers for your reports, view their responses, and perform your reviews.